Understanding the major patterns and processes of evolution has been the focus of attention of evolutionary biologists for decades. Implicitly, and sometimes explicitly, there is a desire to understand the general laws that govern the major changes in biodiversity. In this regard, paleontologists have provided a substantial amount of data to understand important macroevolutionary patterns. Recently, paleontological data has benefited from an increasing development and usage of quantitative methods to uncover deep time biological processes. Additionally, in the last two decades, it has become more common for paleontologists to combine their skills and expertise with specialists from other fields of science (outside of biological or geological sciences), such as in engineering, computing sciences or mathematics. As a result, a plethora of new empirical studies in the field of paleobiology have emerged, thus allowing the possibility of investigating important evolutionary phenomena like never before. One such major evolutionary process that has captivated the attention of biologists for decades is the repeated evolution of particular morphological or molecular traits, termed homoplasy. Homoplasy (such as convergent evolution or evolutionary parallelism) is supposed to provide strong evidence of adaptive evolution. As organisms become better adapted to their environments they tend to accumulate features that provide a better fit to that same environment. Some of those adaptive solutions may have already been developed in distantly related species living in similar environments, thus generating homoplasies between those species. Figure 1. Pictures and anatomical reconstruction of Polyglyphanodon. In 2008, a team of researchers in China discovered a fossil species of lizard (Tyaniusaurus zhengi) that had a complete lower temporal bar just like other lineages of reptiles. Slightly later, in 2013, while visiting the collections of the National Museum of Natural History of the Smithsonian Institute, I came across specimens of another species of fossil lizard that also preserved a complete lower temporal bar. Oddly enough, the specimens I was studying were not part of a new species. Rather, they belonged to the most completely preserved species of fossil lizard from the entire Mesozoic of North America, named Polyglyphanodon sternbergi (Fig. 1). This taxon was originally described in the 1940s, but fundamental aspects of its morphology were still unknown or were overlooked for decades. Interestingly, both these species belong to the same family of lizards, called borioteiioids (Fig. 2). A family of lizards that is entirely extinct and is only known from the Late Cretaceous of Asia, North America and Europe. Along with my colleagues, we identified an ontogenetic series among the specimens of Polyglyphanodon, followed by variation in the shape of the skull that could be linked to sexual dimorphism— a very rare finding for fossil vertebrates, specially reptiles. But most of all, we were interested on the potential functional and adaptive role of the reacquisition of the lower temporal bar in this species and in its family relative from China. 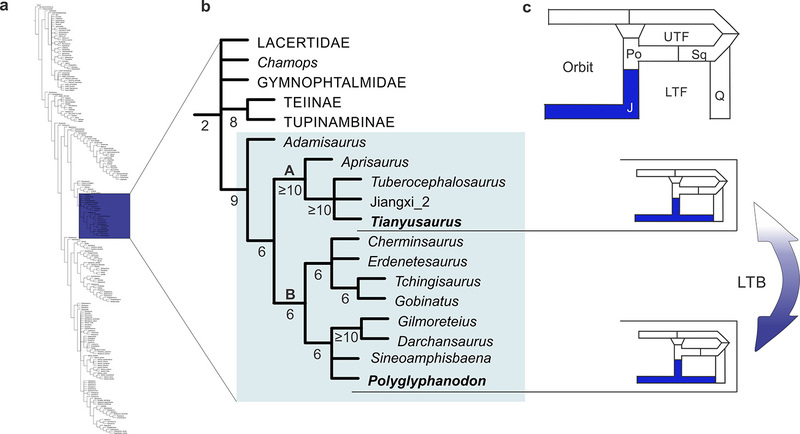 To do so, we used a phylogenetic analysis to understand how those different species relate to each other, followed by a digital reconstruction of a modern proxy for Polyglyphanodon https://www.nature.com/articles/srep24087(Fig. 3). 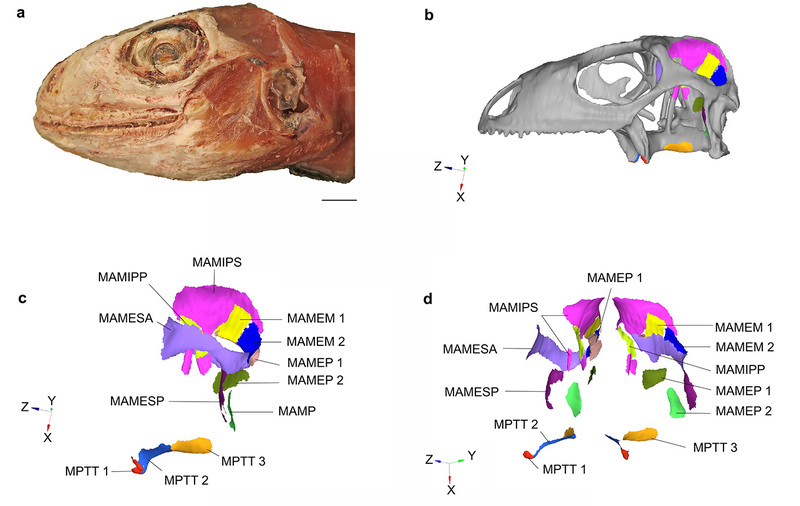 In this 3-D digital reconstruction, we were able to map the attachment sites for all the important muscles for biting in lizards and apply an engineering technique called finite element analysis to test how different skull configurations may be differently adapted to hard biting (Fig. 4). Figure 3. Digital reconstruction of the skull bones and musculature. Figure 4. Stress patterns in different lizard skull models during biting. Our results did not go as expected. Whereas our results for modern lizard skull configurations were unsurprising, and the model similar to Tyaniusaurus indicated a functional advantage on re-growing a lower temporal bar, we found no functional advantage towards biting for the model for replicating the system found in Polyglyphanodon. This suggested a non-adaptive evolution of this major feature of the skull in Polyglyphanodon, and an unusual case of convergent evolution between the North American and the Chinese fossil lizards. 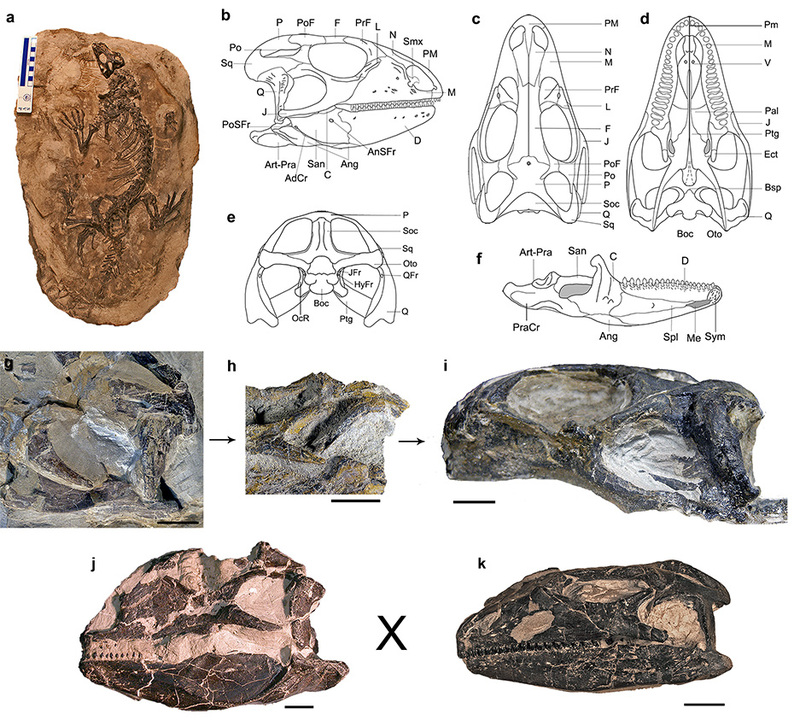 Whereas we have evidence for adaptive (functionally advantageous) evolution of the lower temporal bar in the Chinese lizard, the reacquisition of the same structure in Polyglyphanodon seems to have been caused by other factors (possibly release of functional constraints in the skull). It is certainly interesting that such a release from the functional constraint that governs the skull shape of most lizard species was somehow released in the evolution of this extinct family (borioteiioids). Although we cannot have access to the genetic code of extinct species, it seems plausible that the genetic mechanism for the development of a lower temporal bar is still present in lizards, but it is somehow constrained in most species, whereas relaxed in borioteiioids millions of years ago. Despite the many limitations of the fossil record, however, new technology and analytical procedures are bringing us closer to complex evolutionary processes in the distant geological time.